Yesterday, on a train to Zurich, a Dutchman named Ap asked me if a 8-person video chat was possible. I told him no, not yet. 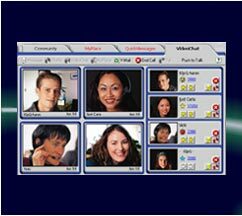 However, I just found a 5-person video chat software that is not only cheap ($40) but also operates in Dutch. hello andrew. i don’t have a comment regarding your blog. just wanted to tell you that after greg and jared helped us paint we sat around visiting and totally remembered you helping us paint in texas. it was a sweet time and fun to recapture it. we miss you guys.